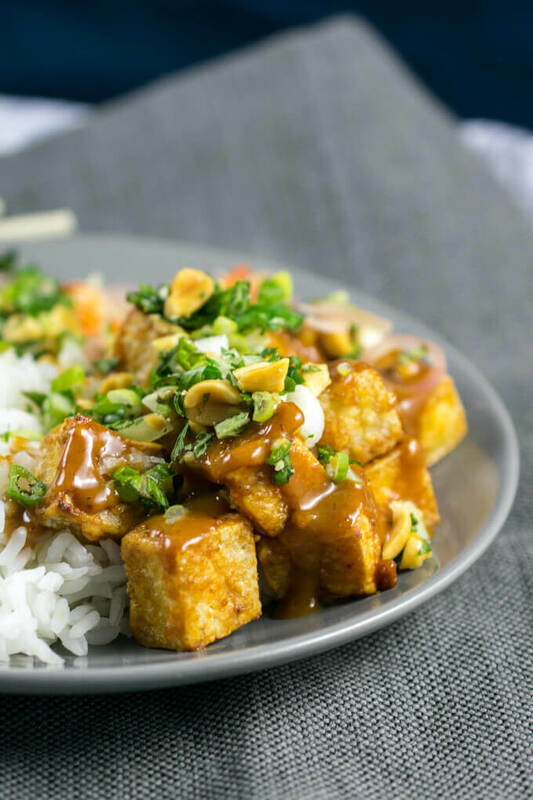 Crispy baked tofu is tossed with sweet and spicy peanut sauce and served with fresh herbs and pickled shallots, for an Asian-inspired peanut tofu recipe that’s fresh and flavorful. If you’re wondering how to make peanut tofu that rocks, you’ve come to the right place! If you’ve perused my poetic waxings about vegan options in Baltimore, you know that I f***ing love a restaurant here called Ekiben. My coworkers don’t have to ask twice to make a lunch pilgrimage there. 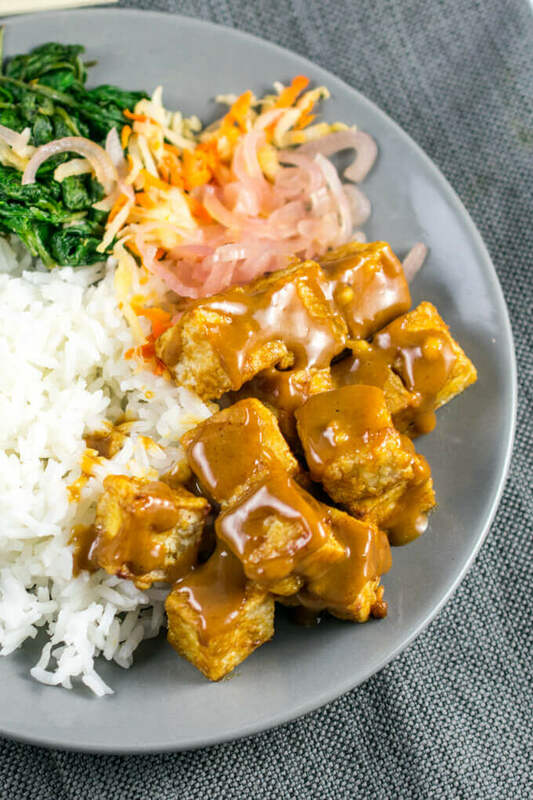 1 peanut tofu bowl, please, and a food coma for the rest of the day! (The tempura broccoli and red beans and rice are also amazing). Last weekend I got inspired to hunker down and try to create that amazing rice bowl with crispy deep-fried tofu, seasonal veggies, pickled shallots, and peanut herb slaw. “It’s unhealthy because of the deep fried,” I told myself. Surely a homemade version with crispy baked tofu would take me similarly to flavortown while saving on oil. Unfortunately, as I painstakingly recreated the flavors I had tasted in the peanut sauce, it became pretty clear that the restaurant’s version contained more oil and sugar than peanut butter. (Cue the comments about ‘no wonder it’s so delicious’). I ended up abandoning ship and making a slightly lighter, but still rich, homemade version of peanut tofu that only emulates the restaurant variety. While the peanut tofu cubes were baking to a nice crisp in the oven, I quick-pickled some shallots in rice vinegar and sugar (a squeeze of lime juice would be a nice addition too), stir-fried some baby kale, turnips and carrots, and whipped up the rest of the peanut sauce. P.S. Totally mix and match your veggies and accompaniments here. This sauce is also awesome with broccoli, bok choy, rice noodles or soba noodles, cauliflower rice, and anything else that’s nice in a stir-fry. Totally do not skip the pickled shallots though! They are a perfect and necessary counterpoint to the richness of the peanut sauce, and super easy to make. After starting with a base of garlic sauteed in oil, I completed the sauce by adding some brown sugar (coconut sugar also works) and water, peanut butter, chili garlic sauce (sriracha or similar), soy sauce, and toasted sesame oil. This is a “fusion sauce” that isn’t specific to one East Asian cuisine, but combines flavors from different sauces I’ve seen before. Ekiben’s menu has somewhat of a Korean twist to it, but the fresh herbs remind me more of Vietnamese food, and sriracha is Thai in origin… you get the idea. 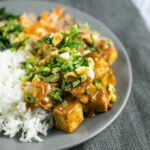 The cooked tofu is then tossed with some of the sauce to make an initial base of peanut tofu, before drizzling it with additional sauce and topping with a generous helping of roasted peanuts, fresh herbs, scallions and lime juice. Sound good yet? Let’s get cooking! 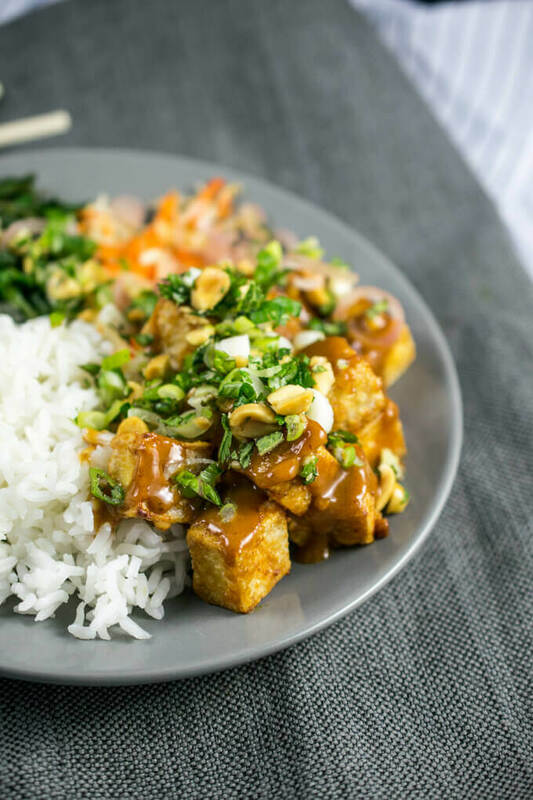 Take your peanut tofu to the next level! Bake your tofu to crispy perfection, drizzle it with peanut sauce, and top it with tangy pickled shallots and fresh herbs. Preheat the oven to 350 degrees Fahrenheit, and line a baking sheet with parchment paper. Open and drain the package of tofu, then press excess liquid from it, either using a tofu press, or by wrapping it in a clean towel and stacking a heavy object on top of it. Cut the tofu into cubes and arrange them on the baking sheet. Bake for 30-40 minutes, flipping halfway through, or until crisped up and chewy. Meanwhile, make the pickled shallots. Combine the shallots, rice vinegar, and sugar in a small saucepan. Bring to a boil and then reduce to a steady simmer. Simmer for about 5 more minutes, stirring occasionally and then turn off the heat and set the mixture aside, seasoning to taste with salt once cool enough to handle. Prepare the peanut sauce. In a bowl, stir together the coconut sugar and water until the sugar is dissolved. In a small saucepan, add the peanut oil and warm it over medium-low heat. Add the minced garlic. Cook, stirring constantly, until the garlic is fragrant, 30 to 60 seconds. Immediately transfer the oil and garlic into the bowl with the sugar mixture. Add the rest of the peanut sauce ingredients and stir until combined into a smooth sauce. Add more water if a thinner texture is desired. If needed, season with salt and add more sugar or vinegar to taste. Prepare the peanut herb topping by stirring all of the ingredients together. Once the tofu is finished cooking, add it to a bowl and drizzle with a few tablespoons of the peanut sauce, gently tossing to combine. Serve warm with cooked rice, vegetables of choice, additional peanut sauce drizzled over the top, and plenty of the herb and peanut topping. GLUTEN-FREE: Be use to use gluten-free soy sauce or tamari. Use gluten-free hoisin sauce, or omit the hoisin sauce and adjust the other flavors (especially the rice vinegar and sugar) to taste, adding a small pinch of Chinese five spice if you have it. 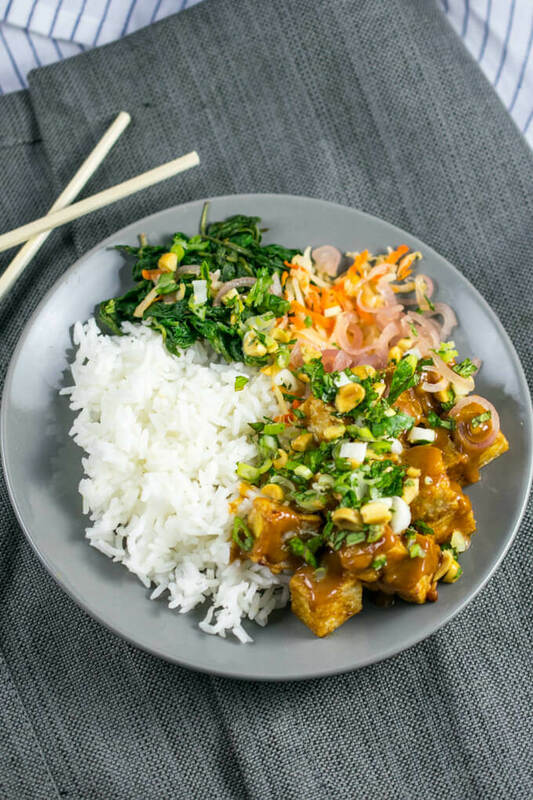 NUTRITION FACTS: Nutrition facts exclude accompaniments such as rice and are calculated using 2/3 of the peanut sauce and shallots (this recipe makes a little bit extra of both). I made this, although I did not use the pickled vegetables and herbs, but the tofu and peanut sauce were great! Hi Shannon: I have you ever used Peanut Powder? It’s basically dried peanut that has been reduced to a powder- almost like flour. You simply add water to create a liquid or pasty consistency. The great thing for me is that it has much less fat- so I use it to make spicy peanut sauce. Planters makes one, as does Stop & Shop (Nature’s Promise line) markets, and I’m sure it can be found in lots of places. Some contain sugar, etc but I like the plain ones. Bon appetit! My god, Shannon, your last answer on this post is the greatest. I laughed. Anyway, could I switch out the peanut-related ingredients with almond? Do you think I would still get an interesting taste? Or would you have another suggestion for people that are not fans of peanuts? I know this is the main thing of this recipe but I’m always looking for new things to try with tofu so… I’d like to make this one! FYI, your blog is my favorite cooking blog! In part because you’re a vegan that doesn’t like mushrooms! Yay! So many vegan recipes out there that are all about mushrooms… Yuck. Hey Anne! Glad to hear from another member of the anti-mushroom crew. I think this would be yummy with almond butter. You will probably want to use a little less when substituting it for peanut butter. And then adjust the remaining flavors to taste – sometimes I find almond butter needs to be balanced by a little extra spice + acidity compared to peanut. As for the peanut oil, just use any neutral oil instead. Hi Polly, I am glad to hear that you found a solution that works for you. I live in Maryland and I”ll have to check out Ekiben next time I’m in the city. This sounds awesome!